But this year the mainstream Pret sandwich is not the worst offender. 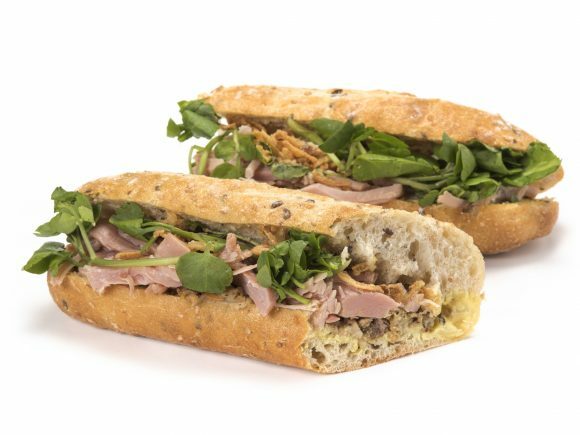 That title goes to the Ham Hock, Stuffing and Apple baguette, whose combination of generously filled bread, bitty ham hock and quite dry stuffing creates a perfect storm of sandwich debris even before you realise they’ve put the crispy onions in this one too. I assume the apple sauce is meant to lend some solidity to the affair but it’s horribly outgunned. I ate this on a train home after working late which was a BAD MOVE – apologies to Thameslink customers and staff for my swinish behaviour, but Pret is at least partly to blame.